At Gamescom 2018, I had the chance to play about an hour and half of the upcoming Battlefield V. The demo was focused on the Rotterdam map in Conquest mode, and with 800 tickets I got to play about a game an a half. From what I’ve experienced, this might be the best Battlefield I’ve ever played. The map was near perfectly designed. The capture points were designed like the five sides of a dice, two columns of two on either side with a fifth point in the centre. A river ran up through the middle of the map creating small islands and chokepoints across the bridges. That being said, the waterway was quite narrow and packed with abandoned boats, so agile foot soldiers could cross the river without much trouble. On top of that, a large elevated train bridge ran horizontally across the map giving players another, often forgotten route into enemy territory. It’s elegant and beautiful in its own right, but also has enough unique landmarks scattered around that it doesn’t take long to memorise most of the battleground. Each of the capture points had a different atmosphere and relied on different tactics to capture and hold. One had a large building adjacent where snipers and machine gunners could hold their ground effectively. Another was a bombed out square with a dozen or so entry points and overhanging windows to assault or defend from. Storming or holding any of these points was a spectacular, visceral affair that made you feel at once like a soldier ready for war and like powerless cannon fodder. 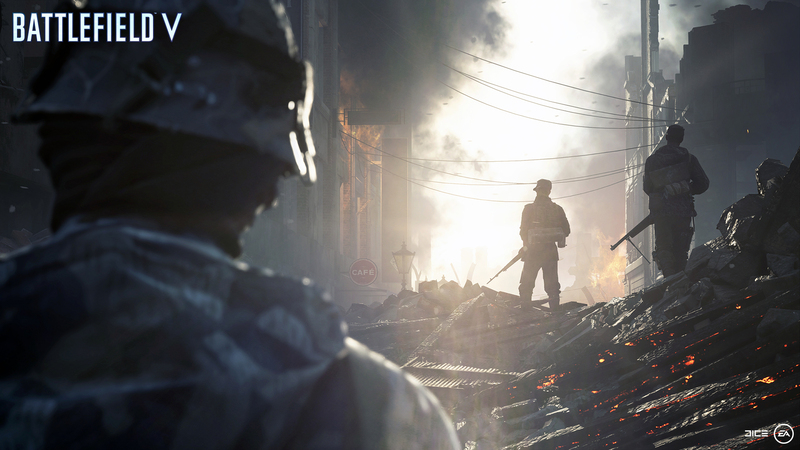 Battlefield V is a bit more intuitive than its last few iterations, and all the better for it. You find yourself committing the same actions for entirely different reasons and it’s a powerful thing. One life I was crawling on my belly around towards a window to flank a group of defending soldiers, the next I was doing exactly the same thing, hoping to escape the area with my life. I spent most of my time as a Medic during my play time with the Battlefield V demo. The Gunner and Sniper classes have never much appealed to me as they exist on either end of the accuracy spectrum. The Assault was fun, but I preferred the mobility of the Medic, with their simple but powerful SMG I moved across the map quickly and provided support and protection for my squad. Once again squads are vital to good team play, and I got to feel first hand the changes they’ve made to the game. Starting with only two or three clips was perhaps the thing I was most nervous about, but in practice, it meant hoping a friendly teammate might throw you a pack and scavenging during the downtime between encounters. It added to the nervous, excited energy permeating the whole game, and took nothing away from it. Having any player able to revive an ally meant that skirmishes and flashpoints can draw themselves out, and fosters a more aggressive playstyle. Leaving a single enemy alive can quickly snowball into starting the fight all over again, and merely pinning a soldier behind cover is no longer viable long-term. There is still enough downtime for you to strategise and explore the map, but now even a simple encounter with two enemies becomes something you need to stay focused on. It also means snipers and ambushers can utilise a team’s lack of communication and leave down players to expose others. And despite all this, medics are still vital to the frontline, providing more health and faster revives than the other classes which can still make all the difference in the world. Battlefield, for me, has always been an exercise in emergent storytelling. Those Battlefield moments you record and show your friends when something amazing, ridiculous or tragic happens on the screen. DICE knows that. With only a few vehicles on Rotterdam, the heavy grumble of a tank approaching was nerve wrecking. Watching your heavy gunners blasted out of windows or snipers catch an ally running across the street were, without a doubt, more cinematic than most Hollywood films. Every life and death in my time with Battlefield V was worth talking about, not that I would bore you all with a run by run of the time I spent with it. This is the most fun I’ve had with a Battlefield game in a long time and that’s even having played exclusively with strangers. Friends together will be blown away by the simplified feel and deep, dramatic combat when the game releases in November. However, the Open Beta is right around the corner, so get ready with your platoon.